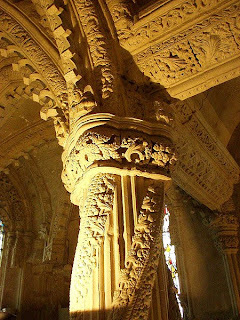 From the website of Rosslyn Chapel. 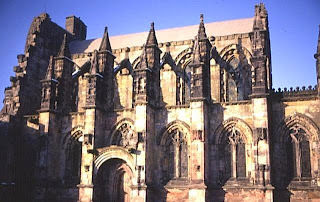 Dedicated in 1450 as the Collegiate Chapel of St. Matthew, William St. Clair founded the chapel for his family with a staff of a provost, six prebendaries and two choristers. Collegiate chapels like this were intended to pray for the soul of the founder and to spread intellectual and spiritual knowledge. 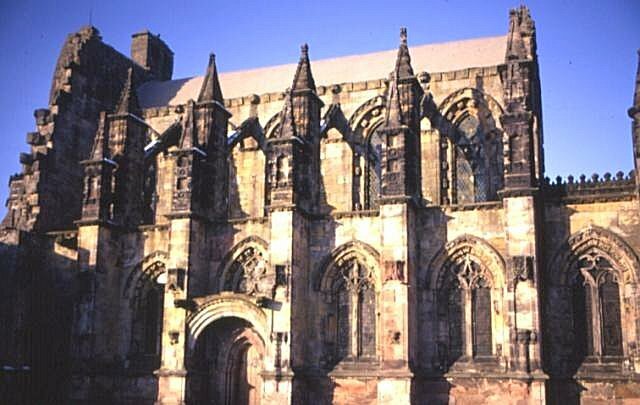 Rosslyn's extraordinary architecture and carvings have also inspired generations and meant its fame has endured over the centuries. The interior of the chapel is gorgeous. The chapel still serves as a place of worship for the congregation of St. Matthew's Episcopal Church. The carvings and, indeed, the entire structure are extraordinary. I don't know why I didn't take pictures of the exterior of the chapel, but photography was not allowed inside, which didn't stop others from snapping away. 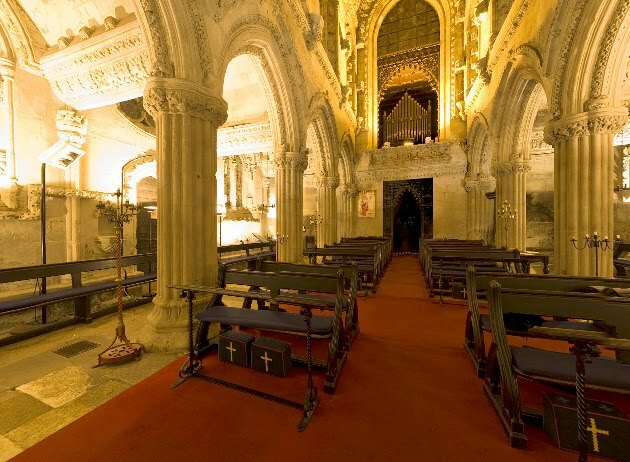 The chapel was filled with tourists and the voice of the guide, which detracted some from the visit, but what can I say? I was one of the tourists. I'd much rather have experienced the chapel within the context of a worship service, but I realize that I can't have everything. The "Apprentice Pillar", or "Prentice Pillar", gets its name from an 18th century legend involving the master mason in charge of the stonework in the chapel and his young apprentice. According to the legend, the master mason did not believe that the apprentice could perform the complicated task of carving the column, without seeing the original which formed the inspiration for the design. The master mason travelled to see the original himself, but upon his return was enraged to find that the upstart apprentice had completed the column anyway. In a fit of jealous anger the mason took up his mallet and struck the apprentice on the head, killing him. As punishment for his crime, the master mason's face was carved into the opposite corner to forever gaze upon his apprentice's pillar. What an enchanting place. I'm so pleased that MadChauffeur thought to take us to visit the lovely chapel. I never saw a centuries-old church that I didn't love, so far as I can remember. View a panorama of the interior of Rosslyn Chapel. 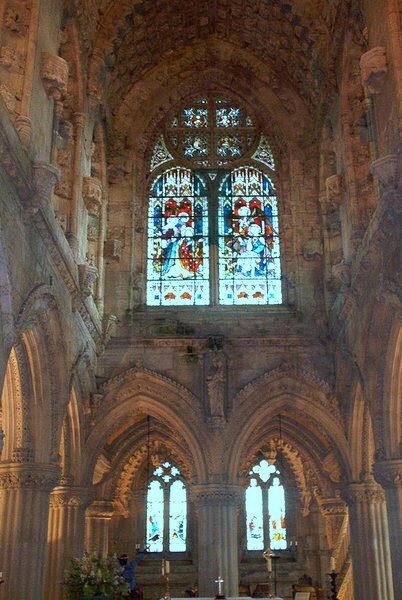 Those of you who have read The Da Vinci Code (yawn) know that the chapel is featured in the book. Pictures and Apprentice Pillar legend from Wikipedia. 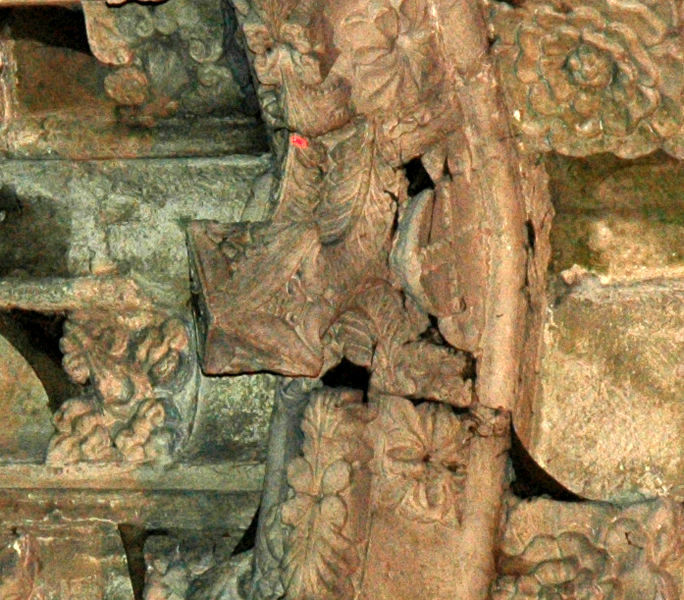 I loved the gargoyle faces and the stuff like the carving of Lucifer upside down, and the depictions of the Green Man. It was a really pagan little place, actually. Cathy, the chapel was, indeed, filled with pagan-like carvings. Victor and I were also quite taken with the chapel, did you see the carving of the corn stalks? They said it was sort of proof that the Knights Templar got to the new world. When we were there the outside was covered in scaffolding as they were working on the exterior. It was an amazing place to visit! Wade, I saw the carving of the Indian corn. I wonder.... I'm pleased to say that the scaffolding was gone when we visited. Truly, a lovely church. Sounds and looks as if the Mad One is a great tour guide. Whiteycat, he is. MadChauffeur knew the places and the history. He should hire himself out for tours. Rosslyn is very interesting but I also want to recommend you to Kilpeck - I will look up the details for you! Seeing you liked Rosslyn Chapel I thought you might have a taste for the mysterious& weird so might like Kilpeck; praps you might fit it in on your next visit here? And if you’ve a strong constitution and the “Sheela Na Gig” interests you see here. Truly weird. PS This “Sheela” has got nothing to do with women being called “Sheila” in Australia, has it? Thought the addresses above might work as links - but not so! Wonder why? MikeN. Mike, the links worked from my email that I received with the comment. The pictures are wonderful. What that place needs is some corbels! And Sheela is naughty! I hope THAT Sheela has nothing to do with the Australian Sheila. My friend, Cathy, who commented upthread is originally from Oz. You should learn hyperlinks. Here is the link to your pictures, and here's the link to the naughty Sheela.